Begin your tour with a visit to the lush and beautiful Yu Yuan Garden, a classic creation of the Ming dynasty. Travel on to explore the ancient Shanghai Old Street, which originated during the Qing dynasty. Shanghai's waterfront, otherwise known as the Bund on the scenic Huangpu River, offers local culture, sights, and sounds, as well as soaring skyline views at the International Architecture Exhibition. The tour takes full advantage of Shanghai′s incredible Museum of Ancient Chinese Art. Home to a collection of over 120,000 precious and rare works in 21 categories, this is the most remarkable cultural institution in the city. Immerse yourself in the rich history of the ancient Chinese and the significant works of art displayed there. After a delicious lunch, enjoy the view as you drive along the former French Concession to browse the Shanghai Arts and Crafts Store. A tour of Shanghai would not be complete without the next stop, the Jade Buddha Temple with its priceless and extraordinary Burmese jade statues. Your final stop will be Xin Tian Di, a stylish and exciting nightlife district boasting many boutiques, pubs, and restaurants. Choose to stay and play here on your own, or remain with the group for a return trip to the hotel. 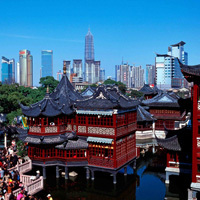 Discover the “can′t miss” highlights of Shanghai! Begin with a visit to the Bund, Shanghai′s picturesque waterfront, well known as the International Architecture Exhibition for its spectacular soaring skyline. From here, enjoy sweeping views of both sides of the Huangpu River. Traveling on, visit the intricately designed Yu Yuan Garden, a classic creation of the Ming dynasty, and the ancient Shanghai Old Street, which originated in the Qing dynasty. Enjoy more of Shanghai′s history as you drive along the former French Concession, a charming neighborhood established while Shanghai was a French settlement. Take time to browse and shop at the Shanghai Arts and Crafts Store before the last stop at Xin Tian Di, a stylish nightlife district with a variety of boutiques, pubs and restaurants. Take advantage of the entertainment here on your own, or choose to return to your hotel with the group. Our evening begins with an astounding performance by the Shanghai Acrobatics School and Troupe. Watch incredible feats of skill and grace from actors and actresses who have won hundreds of gold medals in international acrobatic competitions. After the show, travel by luxury coach through the city for fabulous views of Shanghai at night. See how this busy metropolis mixes ancient and modern at attractions like People's Square, the city lights along the Bund, and the former French Concession District. The final stop will be Xin Tian Di, a trendy neighborhood boasting boutiques, pubs, and restaurants where you can relax and enjoy the Shanghai nightlife. Here, choose to continue exploring on your own or return to your hotel with the group. You will experience two picturesque towns, Su Zhou and Zhou Zhuang, each unique in the splendors they reveal. 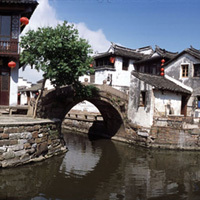 Su Zhou is one of the oldest towns in the Yangtze basin, founded in about 600 BC. With its interconnected waterways and beautiful environment, the city is often referred as "The Venice of the East." Su Zhou was one of the few cities in China to escape the ravages of the Cultural Revolution and its famous gardens survived almost intact. 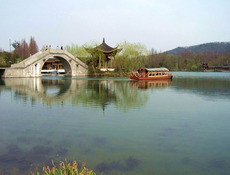 Visit the Master of Nets Garden, Panmen Ancient City Wall,Grand Canal and Silk Factory. After lunch travel to Zhou Zhuang which is well known for its beautiful environment and simple Architecture, well preserved for over 900 years. The majority of the town's residences were built in the Ming and Qing Dynasties, and nearly 100 classic courtyards and 60 carved-brick archways are still in use. Visit the old residence in the old town and take a boat ride there. Transfer back to Shanghai after sightseeing. Once described by Marco Polo as "the most beautiful and magnificent city in the world" it has helped making Hang Zhou one of the leading tourist attractions in all of China. It is a city rich with history and culture, spanning back over 2000 years. It made a name for itself in the sixth century, when the Grand Canal opened up and linked the area to other centers of trade. The Song dynasty helped to make Hang Zhou famous when the imperial family moved there in the 12th Century. With its inviting views and outstanding scenery, the area soon became popular with numerous artists, poets and painters seeking inspiration in this little bit of "paradise." A 2.5 hours high way drive will take you to the city of Hang Zhou. You will first cruise across the West Lake to view unforgettable scenery such as the Three Pools Mirroring the Moon, the Bai and Su causeways, and Solitary Hill. The boat ride will be end at the Fish & Flower harbor. 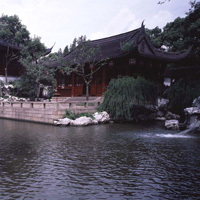 After lunch, you will also visit Guo Garden Villa which is the nicest garden villa in Hang Zhou. The next destination is Six Harmonies Pagoda, built during the Song Dynasty to ward off floods from the nearby Qiantang River. Finally, a visit to Meijia Tea Village can help you discover the history of Chinese tea and the tea ceremony.